The World Health Organization is warning that the Ebola virus is now killing 70 percent of those infected in Liberia, Sierra Leone and Guinea, with new cases projected to reach 10,000 per week by December. There is nothing in place or in the plans of the “international community” that will prevent the excruciating death of tens of thousands before the year is out; the short term outcome is already written in the ghastly patterns of contagion. No one knows what lies beyond the computable boundaries of this viral conflagration, but its origin is far from mysterious. The real vector of mass death that is stalking West Africa is not the fruit bat, but a global system of plunder that has rendered vast swaths of humanity hyper-vulnerable to the predations of micro-organisms and their fellow man. Millions of Africans are among the pre-dead – marked for extermination through disease, hunger, war and the myriad other components of imperialism – the beast that, like some species of bats, can only survive by gorging on the blood of others, leaving its victims weak and pathogen-ridden. After centuries of fattening the colonial bat, the Ebola-afflicted countries have almost no structural defenses against even the tiniest invaders. Liberia and Guinea have only one doctor for every 100,000 citizens; Sierra Leone has two. These statistics ensure that large numbers of Africans are condemned to early, painful deaths. The system guarantees it – NOT the three nations’ health care systems, which do not exist in any meaningful sense, but a global capitalist system that forces developing nations to eliminate public services or face economic strangulation and regime change. Doctors disappear, or are never trained, or drain their brains to foreign lands, or serve only the rich. Public health is a fiction, and epidemics are inevitable. “It could have been Ebola, it could be something else – it could be cholera or whatever. All predictable,” said Allyson Pollock, a British professor of public health research and policy, in an interview with Tariq Ali. In fact, death comes to Africans from a host of microbes; malaria kills one person in sub-Saharan Africa every 30 seconds. After millennia of exposure, Africans are generally less vulnerable to malaria than Europeans, but they die of the disease in far larger numbers because European and American imperialists systematically prevent them from developing adequate public health services. Germs don’t conspire to create the conditions that kill Africans in great and unstoppable epidemics – capitalists do. This is mass murder in the interest of profit – which the colonialists have been up to for centuries, and the same mission Barack Obama and his neocolonial ilk have assigned themselves in the current era. As I wrote over a decade ago, U.S. policy is to keep the masses of Africans “barefoot, sick, hungry and afraid.” The people must be locked in perpetual poverty, dependence and absolute insecurity and fear, lest they challenge the imperial order. Public health services are perceived as a threat to global capitalism. AFRICOM, the U.S. occupation force on the continent, brags that it provides health care to hundreds of thousands of African soldiers and their families – the most cynical deployment of medical resources imaginable. The U.S. war machine, the ultimate threat to “Third World” nations that dare to invest in public health and other services, offers African militaries medical services that U.S. policy prevents their own governments from adequately providing. Washington maintains a health care desert in Africa, and then uses AFRICOM doctors and medicine as a bribe for the loyalty of African soldiers. But the U.S. has no intention of enhancing the health status of the African masses, who must be kept in a state of complete insecurity. Actually, 25 beds wouldn’t make a dent in the epidemic, and many in the international aid community said so. In mid-September, Obama announced plans for a much bigger U.S. Ebola aid mission, including more field hospitals and, for the first time, a number of doctors and health care workers, at the cost of an additional $88 million – still a pittance for a superpower. Meanwhile, Cuba, a country of 11 million people with a GDP of only $72.3 billion (compared with a U.S. GDP of $17.3 trillion) fielded “the single biggest medical force on the Ebola frontline…totally showing up the United States,” according to Business Insider. 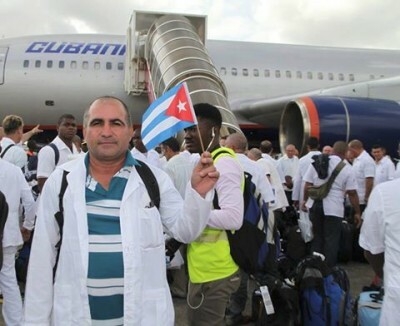 165 Cuban health workers arrived in Sierra Leone, a contingent that will soon grow to 461 – part of the 50,000 health professionals the island nation deploys in 66 countries. The Cubans outnumber the African Union’s 100-person health care contribution to Sierra Leone, the second largest, and will exceed the regional total of the international aid charity Doctors Without Frontiers (Médecins sans Frontières). Socialist Cuba sets the international pace in the battle against Ebola, just as it has in Haiti, where Cuban doctors have long been the closest thing to a Haitian national health service. Without the Cubans, much of the Haitian poor would have no effective access to health care at all. When the earthquake hit in 2010, 350 Cubans were already in the country, soon to be joined by nearly a thousand more. Since 1998, Cuba has trained about one thousand Haitian doctors – the biggest source of physicians in the country. In truth, Cuba is in a class by itself: a country whose foreign health care policy is identical to its domestic health care policy – to serve the people by keeping them alive. If the United States attempted to match Cuba in global health care, doctor for doctor, it would cost Washington many tens of billions of dollars – far more than Havana spends on its total national budget. But, such a competition will never happen, because the purpose of U.S. foreign policy is to impose the rule of capital in every corner of the world and every aspect of life. Rather than match Cuba in medical assistance to poor nations, Washington ceaselessly pressures countries to expel Cuban doctors. Embarrassed by Cuba’s magnificent mobilization in the Ebola crisis – a response noted by most of the world – Obama now pledges to spend $400 million to have his military build a dozen 100-bed hospitals, deploying 4,000 troops. As shown by his initial reticence to offer any meaningful aid even to Liberia – a semi-colony of the U.S. for nearly 200 years – Obama would prefer not to set any precedent of supplying health care to the African citizenry. However, if a show of compassion must be made, then the administration is pleased that AFRICOM gets the credit. Most Americans don’t really give a damn about Africans facing annihilation by Ebola – or AIDS, or malaria, or the six million Congolese that have died at the hands of U.S. allies and henchmen. The same goes for the nation’s “liberal” newspaper-of-record. The New York Times for Tuesday, October 14, featured only two in-house stories on Ebola in Africa, but posted nine articles on Ebola-related news in the United States, Europe and Australia, i.e. “white” countries. White people’s “concern” (mostly, for themselves) about Ebola trumps the plight of Black people who are dying from the disease. If Ebola renders West Africa too dangerous for continued U.S. troop deployment, the American public will readily forgive Obama for allowing AFRICOM to turn tail and exit the region. After all, Americans don’t want their troops put “in harm’s way” for the sake of sick Africans.